Thomas Seelye Arms (1893-1970). Born in Cleveland, Ohio on March 22, 1893. B.S. from VMI in 1915. Commissioned in the Infantry in 1916. Served in Tientsin, China 1921 - 1922. Graduated from Command and General Staff School in 1931. 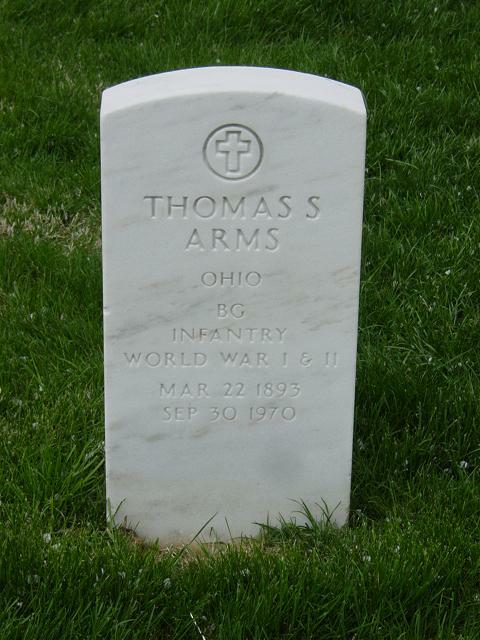 Instructor at the Infantry School 1931-1935 and Ohio National Guard 1935-1940. Commanding Officer of 159th Infantry December 1941-October 1942. Instructor in India, then China November 1941-February 1945. Brigadier General in April 1943. Commanding General of Replacement and Training Command in 1945. Retired in September 1946. Decorations included the Legion of Merit. Died on September 30, 1970.